Oops, I have been a bad blogger again and neglected to update, again. December has been a really busy month at work due partly to increased demand, but also to there being absences and such. Plus prepping for Christmas take a bit of time and energy. These are excuses and really I should be better prepared, but that's why there's been no update for a few weeks. I'm off work now until the new year so will try to get some posts stored up and get back to updating regularly. I've realised that this year hasn't been so good for regular updates as previous ones. I'll try to do better. I'm not religious any more (haven't been since I was child, when I was technically Anglican), but I do celebrate Christmas in a secular way with my husband who isn't religious, and my family who are a mixture of Christian, Atheist and Agnostic. We usually have a fairly quiet Christmas which involves eating traditional food and watching various Christmas films. Plenty of time for blogging amongst that. Best wishes whether you are celebrating or not. 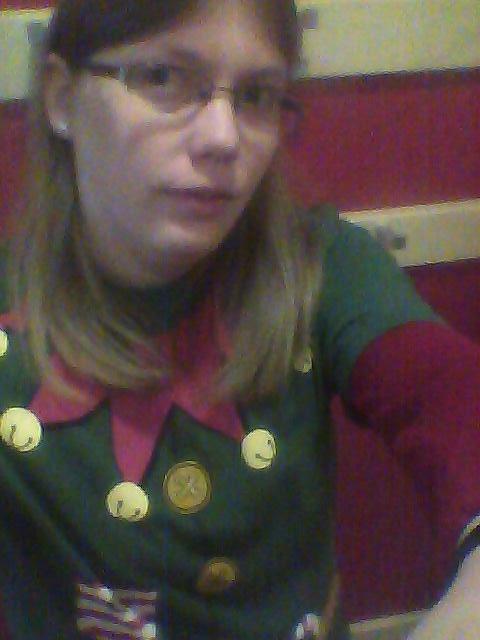 Here's a terrible picture of me being an elf the other week when I was volunteering at a community event. I do not take many selfies, you can probably tell.